Currently the availability of Classic Alfa tyres is exceptional and as good as it ever has been. When the Alfa 1900 first came out in 1950, the 165SR400 Michelin X tyre was in production however the likelihood is that the 1900 fitted crossply tyres 130/140X40 Michelin SCSS. Both of these tyres are still in production with Michelin where of course the quality is never in doubt. 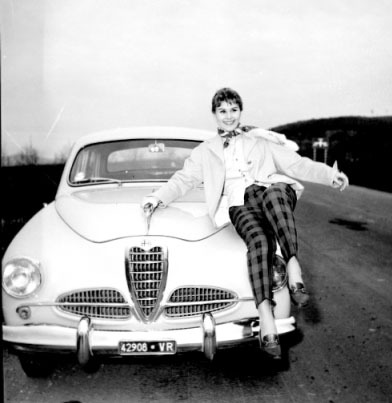 In 1952 PIRELLI introduced the 165HR400 CINTURATO ™ which was a radial tyre designed to offer the progressive handling that was needed for sports cars, and became the tyre of choice with Alfa Romeo on their 1900 model and continued through the Alfa Romeo 2000 and right throughout the production of the 2600 in 1968. As you can imagine the demand for tyres built to fit on 400mm rim are minimal. Wheels are predominantly made in imperial inch sizes. So for some time now we have to be thankful to Michelin for supplying the SCSS tyres and the famous Michelin X But for 50s and 60s sports car owners of Alfa Romeo and Lancia Aurelia & Flaminia the fact that in 2016 PIRELLI re introduced the 165HR400 CINTURATO ™, the only H speed rated 400mm tyre is excellent news. Because, in period, these millimetric radial tyres were of course the tyre of choice so the wheel manufacturer Ruote Borrani started making 400mm wheels for Ferrari 250 GT and Aston Martin DB2/4 & DB4 so they could take advantage of the performance offered by the 165HR400 PIRELLI CINTURATO ™ too.